The Assessment of Debt Sustainability Cyprus document (see Memorandum for link) is a broad economic analysis of the Cyprus economy's shift from growth pre-2009 to increasing crisis. 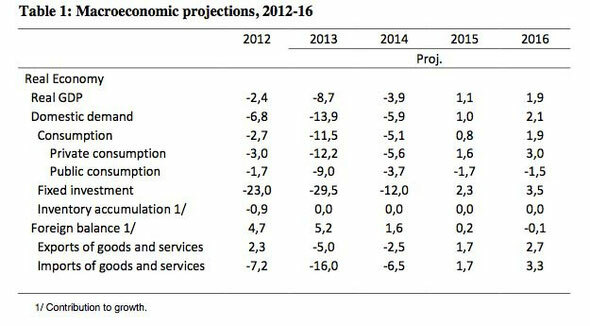 The most important part of the Assessment is the chart of economic forecasts - Table 1 - (reproduced below) and the assessment and allocation of funding needs. In this GDP is forecast to fall by 15% between 2012 and 2014 before returning to moderate growth in 2015. In the same period domestic demand is forecast to decrease by 26.6 per cent, private consumption to fall by 18.8 per cent and in public consumption by 14.4 per cent. Fixed investment in the same period is expected to crash by 64.5 per cent and imports abd exports to fall 29.7 per cent 7.5 per cent respectively. to achieve a continuous strengthening of the primary budget balance over the programme period, resulting in a primary surplus of 3% of GDP in 2017 and 4% of GDP in 2018, maintaining at least such a level thereafter (p. 6). The Note on the 'Assessment of the actual or potential financing needs of Cyprus'sets out the total funding requirement of the programme period Q2-2013 - Q1-2016 as €23bn (see Memorandum). As commentators have pointed out the total funding requirement for the programme seems to have grown from the 16 March 2015 bailout meeting total of €17bn with Cyprus contibuting €7bn (to be raised from the now-infamous bank levy - €5.8bn - and the rest from a new withholding tax on investment profits) to a total in the 25th March meeting of €23bn with Cyprus contributing €13bn. In the 25th March meeting it was agreed to raise the total funding for the prgoramme from Cypriot bank bail-ins from €5.8bn to €10.6bn. In other words, the cost to bank account holders to bail out Cyprus’ financial sector increased by nearly €5bn in nine days. That’s almost a third of the island’s entire economy (FT Spiegel Brussels Blog 10 April 2013). The table below sets out the funding needs of the revised €23bn programme figure and the allocation of the burden of that funding between the ESM/IMF and Cyprus as set out in the DSA and its accompanying Note. The total funding burden for Cyprus in the table is over €13bn because it includes privatisation receipts that are forecast to arrive after the end of the programme in 2016. No explanation is given in the Note or DSA with regard to this increase in financing needs. This caused astonishment and anger when the DSA document was leaked on 10th April 2013. In effect the 'burden-sharing' in the second set of figures has resulted in no sharing at all - Cyprus's part of the burden (from €7bn to €13bn) rose by 57 per cent while the ESM/IMF burden stayed exacly the same. And its proportion of the share of the burden also rose from 53.8% to 56.5%. Cyprus' debt outlook is challenging, but [the programme] will allow Cyprus’ public debt to remain on a sustainable path, provided that there is strong implementation of the adjustment programme (p. 15). How is the huge 35 per cent increase in the bailout/programme total in nine days to be explained? "People have been comparing apples with pears and coming up with oranges." Rehn that the €17.5bn earlier total, "is related to net financing needs, while the larger figure of €23.5 is a gross financing concept" which includes additional buffers to allow for weaker fiscal developments and additional costs in banks. an increase ... in the stealth outflow from banks [prior to the bailout that] was much worse (read bigger) than previously reported, leaving banks with a far bigger [recapitalisation] hole to plug (Zero Hedge 11 April 2013). Another blog post at Zero Hedge, this time by the delightfully named Testosteronepit, (13 April 2013) gives a more detailed account. He says that the new figures were met with outrage in the Cypriot parliament. In addition, three members of the governing council of the Central Bank resigned allegedly protesting to President Anastasiades that the council served only for “decorative” purposes. It suggests firstly, that EC economists really have very little idea about the eventual size of the economic catastrophe Cyprus might suffer. Mr Rehn acknowledged the uncertainty created by the chaotic handling of the bailout and said it was almost impossible to know how hard the Cypriot economy would be hit. “I don’t deny under the current circumstances there is some uncertainty on the exact figures,” Mr Rehn said. (FT Spiegel 12 April 2013). Secondly, it suggests that EC officials are making up policy as they go along, in effect raising the percentage of bail-in losses to be imposed on depositors from one day to the next. Thirdly, it suggests that those who are responsible for the drafting and presentation of these documents have little understanding of the importance of justifying and explaining them to a wide range of audiences (leaking was almost inevitable) - from Euro Finance Ministers, other EZ member states and not least the people of Cyprus who are both frightened and enraged by what they see as an arbitrary and unjustified increase in the level of the 'robbery' and 'expropriation' they are to suffer. And fourthly, the self-effacing and football-loving Mr Rehn needs to realise that the increase in the price of the apples, pears and oranges that different people are counting are all going to be paid for by the people of Cyprus and/or the uninsured depositors in the domestic operations of the Bank of Cyprus and the now shuttered Laiki Bank. It is all very well to say that the new bigger €23bn figure is a 'gross financing concept' but the DSA and the 'Potential Funding Note' make no hint of this and from on high they allocate all the new costs to Cyprus in a macabre example of asymmetrical 'burden-sharing'.